Paris is a city that captures the imagination of many. I have read about it, studied its history, and seen its streets captured in films, but I have yet to see the beautiful city for myself. Traveling abroad isn't in the cards for me at this point in my life, but I hope in a few years I will be able to see some of the famous and historical places that have haunted my imagination. Paris is certainly on that list. I am not typically one to read nonfiction travel guides for fun, but I was lured into this one by the promise of historical figures. I wanted to imagine the streets of Paris as they were when people like Marie Curie walked them and to think of how things were when famous events like the French Revolution were occurring. This lovely little tome allowed me to plan my ideal Paris itinerary through a historical sense. Each chapter focuses on a specific area of the famed city and sheds light on some of its illustrious residents. After learning more about the people who have called Paris home, each chapter provides specific advice for travelers to make the most of their experience in the location. I know these tidbits will be immensely helpful when I do finally make my way to France. 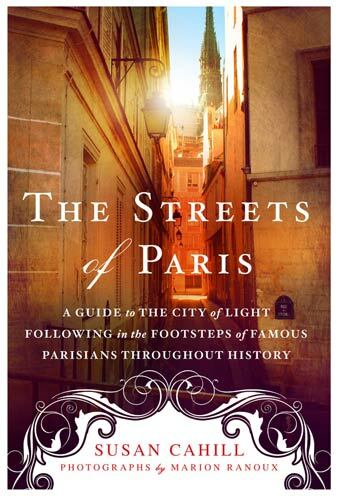 The Streets of Paris is a well researched and intriguing travel guide full of advice and pictures to help you make the most of your Paris trip. It will certainly be in my carry on bag when I board a flight to the city of light. One Last Gripe: The pictures, while a nice addition, are modern. I would have liked some historical photographs to accompany the historical segments that would allow me to make comparisons between the past and present. First Sentence: "Beauty is in the streets," they say in Paris. For hundreds of years, the City of Light has set the stage for larger-than-life characters--from medieval lovers Heloise and Abelard to the defiant King Henri IV to the brilliant scientist Madame Curie, beloved chanteuse Edith Piaf, and the writer Colette. In this beautifully illustrated book, Susan Cahill recounts the lives of twenty-two famous Parisians and then takes you through the seductive streets of Paris to the quartiers where they lived and worked: their homes, the scenes of their greatest triumphs and tragedies, their favorite cafes, bars, and restaurants, and the off-the-beaten-track places where they found inspiration and love. Each chapter opens with a beautiful four-color illustration by photographer Marion Ranoux, and every tour begins with a Metro stop and ends with a list of "Nearbys"--points of interest along the way, including cafes, gardens, squares, museums, bookstores, churches, and, of course, patisseries.